In November (or October for those who vote by mail) we will go to the polls to select candidates for elected office across the state. We have the opportunity to pick city council members, mayors, and for those lucky few who live in Utah’s 3rd Congressional District – a new congressperson. (Ogden Election Information: https://www.ogdencity.com/208/Election-Information). The election is on November 7, 2017, or vote by mail ahead of time. This month’s commuter column is dedicated to profiles of all of the various candidates running for city council in Ogden and asked them about cycling, their campaigns, and other issues facing Ogdenites. 1 – What position are you running for on the city council? 2 – Please share with readers why you are running for office. 3 – Have you been involved in any efforts to promote cycling or improve safety for bicyclists? Please explain. 4 – How often do you bicycle, walk or use public transportation to travel around the city of Ogden? In your opinion what are the biggest challenges faced by people who use alternatives to driving their own cars or trucks to get around Ogden? 5 – Describe how you would support the implementation of the Ogden Bicycle Master Plan, including what budgetary or policy commitments you would make to achieving yearly milestones. 6 – What are some of the key steps you would take to make Ogden a more bicycle friendly city? 7 – Please feel free to share anything else that you would like readers to know about you. Each candidate that submitted responses were also invited to submit a photo for inclusion in the article. Take a few moments to get to know the various candidates running for Ogden City Council. 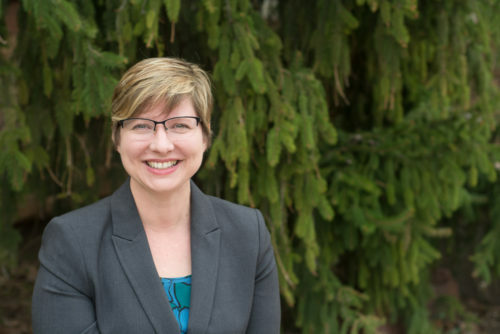 Angela Choberka is running for Odgen City Council in 2017. 2 – I hope I can bring another perspective to the council: one that promotes community, equality, and accessibility. As a resident of central Ogden, I hope to speak for those of us who choose to live here because want to build on our community’s assets. We love the diversity of our neighborhood and want to help everyone who lives here enjoy a safe and pleasant daily experience. 3 – I hope I can bring another perspective to the council: one that promotes community, equality, and accessibility. As a resident of central Ogden, I hope to speak for those of us who choose to live here because want to build on our community’s assets. We love the diversity of our neighborhood and want to help everyone who lives here enjoy a safe and pleasant daily experience. 4 – Safety is the most important challenge to pedestrians, cyclists, and runners. The sidewalks throughout the city are not safe for most people when they are walking, but especially are not manageable for people who have special equipment such as wheelchairs, walkers, or canes. They are uneven and damaged. I walk through downtown and central Ogden quite often and negotiate these elements myself. This is part of my desire to be healthier myself, but also to slow down a bit and experience the neighborhood’s amenities at a more elemental level. While you are walking, you notice things you would not otherwise, and you can say hello to your neighbors as well. I also bike down to the River Parkway and enjoy it immensely. I have friends who are regular runners who often fear for their lives because they run on the streets instead of on the sidewalks. People traveling in vehicles do not seem to understand that the pedestrian (runner) has the right of way. This is also the case quite often when I wait at the pedestrian crossing areas. Drivers will often ignore the fact that someone is standing in the crosswalk waiting to walk. I think this is because they see the world from their cars rather than from the perspective of someone who navigates the city by walking, running, or riding bikes. We need to raise the awareness of this issue with motorists. 5 – Living a healthier lifestyle and one where we build upon our community by taking the time to walk or ride bikes through it means making a commitment through not only words but through the allocation of the resources needed to accomplish those goals. The plans created need fiscal notes attached in order to truly come to fruition. I would support the efforts to put specifically earmarked funds toward a thoughtful plan. 6 – We need to continue to raise awareness of motorists and what responsibilities they have to ensure the safety of cyclists. We can also create more and more bicycle-friendly environments like bike lanes and parkways. Make it a norm to watch out for cyclists in our city. Paul Rivers is running for Odgen City Council in 2017. 1 – I am Running for Ogden City Council Municipal Ward One. 2 – I am running on the platform Smart Growth Ogden. Ogden needs a future focus window to correct some past good decisions that were started and are now ignored. Some riders are not necessary enthusiastic about riding their bikes but along with the bus it is their last transportation option. Bicycle riders on the streets are at risk. 3 – I have listened, observed, and now it time for me to act. 4 – I don’t personally ride a bicycle often due an arthritic knee. I drive a bus and I see beginner to advanced cyclists riding in traffic daily. The buses have two or three place bike racks on the front. Cyclists often wait at bus stops and put their bike on the bus to ride safely from point A to Point B safely on some of the most congested multi-lane roads with parking in Ogden that are/have a designated painted bike lane with signage. 5 – There are several roads through mostly residential area where riders routinely ride that link to to the Ogden Trails and Weber Pathways systems. Ogden is a growing city and suddenly we are in need of affordable housing. People are staying with their parents, living with friends and so on to avoid the high cost of rent. This a typical big city problem that meets a lot of resistance. There are several at market rate housing/transit projects going up near the Frontrunner stations (a city to city commuter train). One of my goals for Smart Growth Ogden is to focus on affordable housing by design. Ogden has about 1% Mixed Use zoning and that will need to be increased to accommodate create new residences that meets the need of one or two people living near a transit route. Affordable housing can be bicycle and wheelchair friendly and may not in include parking to cut costs. 6 – Remove the designated bicycle routes from the congested streets and put them on residential avenues. 7 – I received a B.S. in Geography with an emphasis in Urban Planning. Doug Stephens is running for Odgen City Council in 2017. 2 – (1) It is important that we be good stewards to the environment, our parks, open space and trails that will provide a quality of life for those who live here and visit. Ogden is an Outdoors Recreational area and to continue to improve the economic development, we need to take care to the environment. (2) I support the Transportation Master plan that includes a Bike Master plan to improve our streets and sidewalks. The Bike Master plan as a component to education the value of the use of bikes and its safety for those who use this mode of transportation and it also marks the “Bike Lanes” in our city. I would like to see more done in this area. (3) I support Public Safety for our citizens. Along with the element of Public Safety, I have organized 4 Neighborhood Watch program in the city. It is important that we provide a safe community. Our Public Safety employees give professional service to the residents of Ogden. (4) I support fiscal sustainability and transparency for responsible government for the residents of Ogden. (5) I will create and work to have a “Downtown Arts District” to assist the artist in our area. This will add additional opportunities for those to display and show their talents. (6) I support the housing program for the city. We need to provide the opportunity to have the right Housing mix for the citizens of Ogden. (7) I support to improve the public parks in the city. As we improve the parks, then they become Neighborhood Center for everyone to enjoy. Park improvements is an investment to the city and the neighborhoods. 3 – I have been very much involved in developing and promoting cycling and to improve the safety for the bicyclists. I am the Council Chairman of the Transportation Committee. We review on regularly the Transportation Master and the Bike Master plan. Any improvements to the streets in Ogden, the committee in involve to make sure that the “Bike Lanes” are part of the improvements. An example is the improvements with Harrison Blvd. The committee made sure that the “Bike Lanes” were part of the program. I encourage our new and established business, schools, public buildings provide “Bike Ranks” when possible. There is much more we could do but I will continue to work on the importance of bicyclists and their safety. 4 – I bicycle, or walk about every day of the week. There are several challenges that face us who use alternative methods of transportation to get around Ogden. (1) The schedules of the UTA buses and the routes. If I use the UTA bus, I will have to plan for a longer time period. (2) The bicyclists safety and having the public educated about those using the bikes. We need to also plan the routes in the city that would be a safe corridor for the bicyclists use. The improvements will come. I am committed in move forward with these challenges and many more. 5 – The City Council, which I am on, have passed and approved the Bike Master Plan. I support at every budget session that we fund this program. I am very mindful of the importance to develop more use of the bikes in Ogden. Bike riding is good for those who ride them and the air quality. It is also helps protect the environment of our city. As reported in the Standard Examiner on Sept. 19, 2017, the use and interest in cycling is increasing every year. Cycling is part of our future and we need to plan for it. In some of our CIP updates, the city council review the Bike Master Plan to see how Ogden is doing and where we need to improve. I support ongoing funding for the Ogden Master Plan. 6 – There are some key steps that I would continue to review about the use of bikes and bike safety in Ogden. (1) Continue to review the Bike Master Plan. (2) Encourage the development and use of bike ranks where possible. (3) Education is necessary for the safety and use of the bicyclists. With the right education, we decrease those who are injured in crashes. (3) Develop several Bike Parks in some of the city parks. (4) Encourage the creation of Bike Clubs in the schools and throughout the city. (5) Encourage the use of social media to organize Bike Rides. (6) Plan and develop the “Bike Lanes” in Ogden to be more productive. Develop the Green Bike (we need to have a Purple Bike) program. (7) Have Weber State, OWTAC, and the Ogden School District encourage the use of the bikes. They need to supply amenities for those want to use a bike. (8) Continue to fund the “Bike Master Plan”. (9) Set one day aside each month to “Ride A Bike Day”. 7 – Bicycling is become more popular way to get around. We need to plan for the future by developing and funding an effective Bike program. Cycling is good for the health of the public and the environment. It is important that we educate the proper use and safety of a bicyclist. The businesses, schools, parks and public places need provide some amenities for those who use the bike. 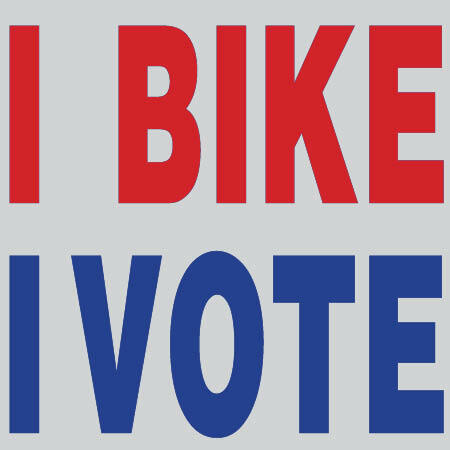 I support the bicyclists and enjoy riding my bike all the time. 2 – Our world is currently experiencing an increase in divisiveness, a problem that invades countries, states, and even our great city of Ogden. This divisiveness can only be contested through the loving hearts and minds of individuals, like yourself. As a young emerging leader in Ogden, I have seen first-hand the power of unity and togetherness. I believe that great things happen when people come together to create. Whether that be the current development of a Creative District in Downtown, bringing artists and community members together to envision a thriving Arts Corridor, or the newly formed Diversity Commission which strives to represent and include all of our diverse communities within Ogden. I have the great pleasure of serving on this Commission. The power of community should never be underestimated. 3 – As Community Services Director for United Way of Northern Utah, I have been involved in health and safety fairs that seek to educate young children about bike safety, including distributing 750 Bell helmets each year through these efforts. I also am an avid hiker of our trails in Ogden and have educated others and myself on bike safety in regards to hiking. 4 – I live in East Central Ogden. Throughout the summer, I make it a priority to walk or bike to Downtown events, be that Twilight Concert Series or the Farmers Market. Due to health issues, I have not been able to enjoy my bike as much as I would like to. Having lived in NYC, which arguable has the best public transportation available, I see how our current methods of public transport could be improved. I believe a huge barrier for people to use public transportation is the availability year-round. Much of our bus stops in Ogden are not sheltered at all. This means in the winter, people are forced to stand in the cold as they wait for the next bus. I also think the bus schedules are not frequent enough, some buses only stopping ever 40 minutes. I see these same issues reflected on our frontrunner station. I think public education in regards to bikes and pedestrians is a critical component in our city as well. Because the majority of our streets do not have defined bike lanes, and our sidewalks are deteriorating, we see both cyclists and pedestrians on our roads. We must educate the public on right of way laws in regards to pedestrians and cyclists and also remedy sidewalks and bike lanes to ensure their safety as well. 5 – What I like about the Ogden Bicycle Master Plan is the varied type of bike lane. From a buffered lane to simple markings, the plan demonstrates a strategic and thoughtful approach to solve our growing population needs for increased methods of transportation. This plan is expensive, but when compared to the cost of road construction, air quality issues due to higher amounts of cars on the road, and other traffic enforcement concerns, the costs seem nominal. I would keep the plan on track and encourage the administration to seek additional state and federal funding to help offset the costs associated with this plan. 6 – As mentioned above, I think education is critical. I also believe that safety is a concern as well. We must also look at crime in East-Central and Downtown Ogden. A barrier for cyclist is bike theft, so ensuring our communities feel safe is a key step in the direction of increased cycling. Twilight is a great example of allowing a more bicycle friendly city. Their “bike valet” allowed myself, and other cyclist, the opportunity to ride downtown, park and not worry. Efforts such as these could easily be duplicated throughout the City. 7 – As the City grows the demand for innovative and progressive thinking on the Council has become critical for the success of Ogden; I offer a fresh, bold, and progressive voice to a seat on the council that has been held by my opponent for 12 years now which has led to a lack of representation for our Municipal Ward 3. New Leadership. New Possibilities. Marcia White is running for Odgen City Council in 2017. 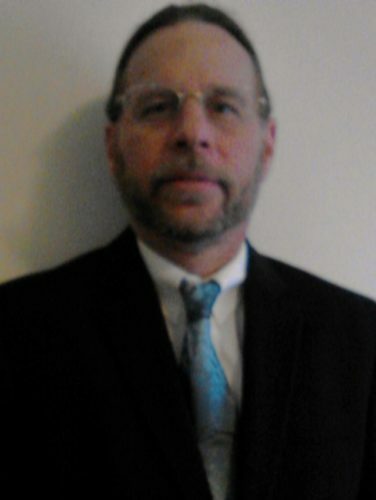 1 – I am running for re-election for the At-Large “A” seat. 2 – Four years ago, I ran on solution-based decisions. From day one, I set forth to carry through my goals of being a vibrant city, having better transportation (including biking), supporting public safety, establishing responsible growth and creating excellence in government. I have been focused on building our community through sound policy making and funding of those goals and I want to continue to use my strategic business experience to follow through with my goals. My primary motivation to run for re-election is to continue to serve the people of Ogden and continue to work on those goals I set about doing four years ago to make Ogden an even better place to call home. 3 – I was fortunate to be one of the team members of the Ogden Bicycle Master Plan. As part of this collective team of private businesses, University and School District representation, Administration and the Council, I heard from everyday bicycle users to casual weekend riders. The Plan which was adopted last year help define a direction in which Ogden can move forward to create designated bike lanes on streets, to create safe bicycle lanes and paths for kids to get to and from schools, and to work with private businesses to make sure there are places for people who ride to have designated bike racks to lock and secure their bikes. In addition to working with this Master Plan, I often participate in events that are designed to get more people involved with biking. The Yeti bike ride is a good example that brings youth and parents together to ride through Ogden and down the Ogden river parkway. 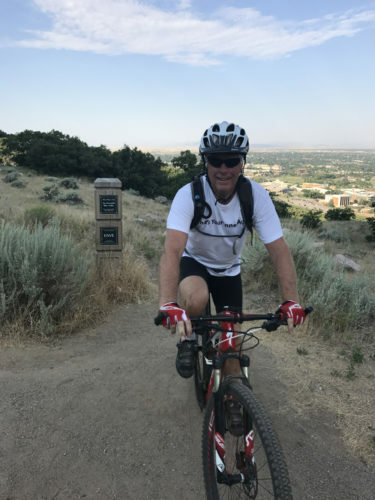 I also participated this summer in an even in which Weber Pathways promoted the use of our trails and it was a great event to encourage biking on our trails that surround Ogden. 4 – I am an avid cyclist and use my bike for both recreation and transportation. I also use public transportation to commute back and forth to Salt Lake City and often walk within my neighborhood. I don’t know if there is just one biggest challenge as it has been difficult this summer to ride with the extreme heat and poor air quality. However, the biggest challenge (taking funding out of the equation as well) of what an Ogden resident might have control over, in my opinion, as you put all of those together, biking, walking and public transportation is the need to understand that Ogden is a “hilly” city. When I get off the Front Runner and am faced with the thought of climbing a huge hill to get home, it is overwhelming. One of the items that was revealed in the Master Plan was the use of streets which was deemed the “Wildcat Wiggle”. This path uses a method in which you can go up a hill, go over on a flat street and then go up another hill. This method gives you bursts of hard effort with some relief on the flat streets. Eventually, you will get where you want to go. Finding solutions to the challenges is what is important to move Ogden forward as a bicycle friendly City. 5 – There were many recommendations and an overall strategic direction that was described in the Ogden Bicycle Master Plan which unfortunately cannot happen overnight. We have included many of the items within an overall Capital Improvement Plan projects and every year I am able to rank and approve the list of CIP projects. In addition, when we are approving streets for resurfacing or redoing, such as the Harrison expansion project, I am making sure that there are active transportation plans included within those projects. As part of the Council strategy, we have a workgroup that looks at projects such as this to make sure we are achieving the yearly milestones. 6 – Many of the key steps, of making Ogden a more bicycle friendly city, are already in motion. One of the biggest keys was the completion of the Bicycle Master Plan. We are utilizing the private/public partnerships with Weber Pathways and Visit Ogden to bring us events that encourage people to ride their bikes. The Ogden Downtown Alliance makes sure there is a safe place to park your bike when you ride to the Farmer’s Market. Our Ogden Police Department partners with local vendors who donate helmets for kids. The City works diligently to sweep our streets of debris along our current designated bike lanes. Weber State University has developed a better plan to encourage students to ride throughout campus in a safe and coordinated manner with those students who are walking. The Ogden Bicycle Collective offers classes for all ages on bicycle maintenance and also provides used bicycles to all who want them. And, this year sponsored, along with the Ogden City Arts, a very successful Bike Homecoming event. There are places to bike like the Ogden Bike Part and the Ogden River Parkway which are safe and out of traffic for all ages. The new Business Exchange development includes bike friendly roads and opportunities for employees to enjoy the bike paths that surround those buildings. The Utah Cyclocross Association, often holds an event or two at the Weber County Fairgrounds. Ogden has several high school mountain biking teams which are encouraging youth to get out and use our trails for practice and competition. So, the key steps ARE happening and the synergy is being felt. Ogden is leading by example and as someone who bikes in Ogden, I’m trying to do my part to encourage the participation by leading, promoting and being an advocate for funding sidewalks, roads and trail infrastructure. Lew Wheelwright is running for Odgen City Council in 2017. 2 – I see a number of short comings that I would like to bring my skill sets to the table to help resolve. 3 – Over the last 30+ years have cut trails, built bridges, repaired trails and helped on trails crews. 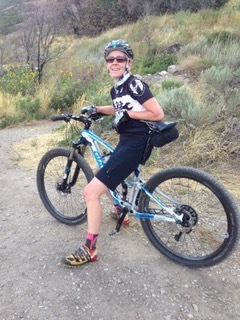 4 – I mountain bike 40+ miles per week most on the trails along the Wasatch front this weekend I'm riding in St George. Don't ride the road because I don't like interfacing with cars and other large objects. Had the crap scared out I'm so I sold my road bike. The education of driver/biker is improving but bikers still have all the risks. 5 – 30 years ago the bike plan and trail system was just a dream. Now we have a great system not only here but nationwide with Rails to Trails work and other local communities. I believe all that's needed is keep the government to a minimum and in list the local volunteers as in the past. In Weber county RAMP will be a great asset if I don't get top heavy. 6 – Share bikes in down town metro and Weber State would be beneficial and should be self-supporting. 7 – I love mountain biking and our local trails, working with land owners and governments is the biggest obstacle to expanding the trail system, we as bikers need to more cognitive of what we have, care and help maintain and always be respectful of the private property owners, and those who hike and run. A little common sense and respect would help our image. Mary Khalaf is running for Odgen City Council in 2017. 2 – My campaign slogan is, “The Common Man is overregulated, overtaxed, and underrepresented” because I believe that. I believe we need more freedoms and we also need to get involved to be represented. 3 – Bicycling is actually a great issue for me. My children, who have disabilities, have come to love our local Bicycle Collective. I love the idea of people in the community coming together to help each other with bicycles. Bicycling is also important to me because the city I’m asking to help lead is a city rooted in healthy living. We are an athletic and outdoors community. It’s something that attracts people to our community and I believe we need to emphasize bike usage to really grow in a smart way. Ogden may be small but it’s growing to grow up. Our little community is connected by bike paths. I want to emphasize these paths to keep Ogden healthy, rideable, walkable, and connected in a growing community. Bike paths and bicycling can help our city grow in a really attractive way. Bicycles also help create a sense of social responsibility to our carbon footprint and encourages Green Living which is an important issue to me. 4 – Something great about Ogden is they have bike paths and parks running right through the city. Until recently we lived in a sop in the business district and we loved that there were green spaces a few blocks away. We visited these areas almost daily and they were really helpful for mental health, physical health, and family cohesion. I personally am battling cancer so I drive almost everywhere but I have walked the bicycle paths and depended on them to help improve my health as through exercise we heal. I would hate it if we didn’t have the walking/biking paths because they give us so much. Even though I don’t walk much I know that Ogden is connected by trails that make it possible to walk from one part of the city to the other. They are a great resource to people who walk through the city. They can play an important role in future traffic planning. We should be encouraging biking in these back trails to ease traffic congestion. 5 – I read the plan and I liked it. It’s ambitious but I believe workable. I would like to see public involvement throughout the process because a big part of making bicycling popular is keeping the people involved. Let’s have Open Houses/meetings to keep people informed and help keep us on track. We can’t get people to bike if we don’t talk to them about it. I would like to see us get creative through funding and even give tax credits for people/businesses who help us go bike friendly. I think we need to build strong community partnerships to make this plan work. 6 – I would like to encourage bicycling events in our community. I believe tourism is important to Ogden’s growth and that tourism should be centered around healthy living. So I would like to see more bike events and festivals. I would like to improve our bike/walking trails so they are more accessible and more attractive/safe. I would encourage bike sharing and rentals where possible. I would like to see more of those eco-friendly sustainable businesses and encourage them where I can. I would ask the Ogden’s Art’s Council to allow a free booth at the Farmer’s Market be open to help educate people on the benefits of bicycling and preferably by a non-profit educational group. I would encourage, and hopefully launch, a public awareness campaign of the benefits of bicycling. Bicycling has to be a part of Ogden’s growth and that means educating the community on bicycling benefits. I would encourage community service days where we ask the community to help upkeep our paths which encourages community cohesion and charity. I believe if we ask our neighbors to work together, to better the community, they will. I would also like to make it easier for bike taxis to prosper in our city which is great for job creation, traffic and city flavor. 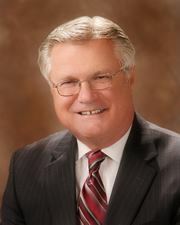 7 – I have been endorsed by the Ogden Chicken Alliance as I’m Pro Ogden residents owning chickens. It’s the most important issue in our community now which has a connection to bicycling because both activities are about rugged individualism. It’s very important to me to keep Ogden close to its rugged roots. Utah is growing & one of the best States to live in because we adhere to Conservative fiscal + social values. It's important to Mary to preserve these values for our children who are risk of being taxed into slavery through bureaucracy & poor management. 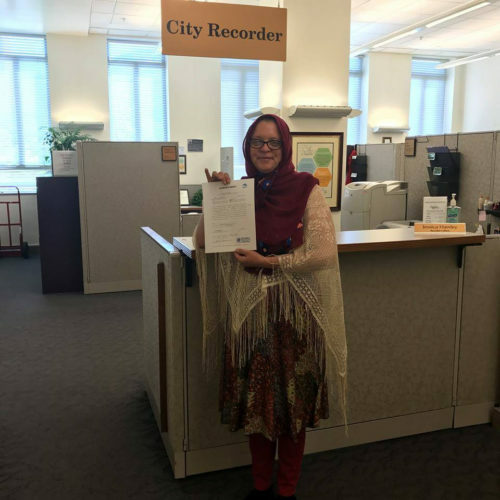 The wife of an Iraqi immigrant gives Mary a unique window into the needs of our growing immigrant community and she hopes she can help Ogden's immigrant community prosper while integrating into the fabric of the city. Mary cares about all people in Ogden and would like to ensure that we all can prosper no matter our origins.